Last week I had to run into town to take my cat to the vet for his annual shots. I was dreading it for weeks because he was just boarded for 11 days at this same vet and he did not have a positive experience. He surprised me though, and wasn't too bad. It was a struggle to get him into the carrier, but he did fine once in the car (just a little meowing). But the second we walked into the veterinarian building he must have recognized the sights and smells and started growling. I was thinking "Oh, boy. How is this going to work? Will they even be able to give him his shots?". Thankfully, even though he never stopped his low growls, they were able to get the injections into him without too much fuss. But then he threw up in his carrier on the way home. He almost always does! UGH! Thank goodness I only have to take him to the vet once a year. Anyway, this is what I wore! It was a cool day, in the low sixties. I didn't feel I needed a coat, so I just wore a utility vest. 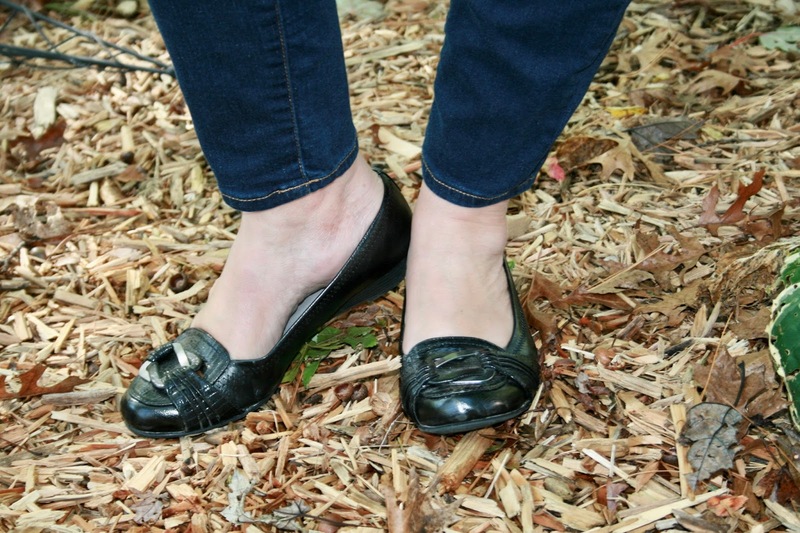 I wore flats for practicality. Normally I'd wear booties when out and about this time of year, but the flats were easy to slip on and off for a quick errand. Plus, it was warm enough to still go with most of my feet uncovered. I got a new hand bag. But I have to share the ORDEAL I went through to get it. Ya'll know I'm a big coupon/bargain shopper. Well, I got this coupon from JCPenney that showed a picture of this bag and it said if I came into the store on this ONE SPECIFIC DAY I could get this bag for only $20.00. Well, it's a cute bag, and normally $65.00 so I drove 45 minutes to town just to buy this bag (I did run my other weekly errands as well. I would never drive that distance just for a handbag.) When I got to the register the coupon only rung it for $20.00 off. I politely argued with the sales associate and he called the manager (who couldn't come to the register) and they refused to honor the coupon. They kept saying "$20.00 off" even though the coupon said "Liz Claiborne Bag $20.00". So I declined the purchase and left. But I was mad. I KNEW it was a technical error and I couldn't believe they wouldn't honor the coupon. So when I got home I contacted corporate and found out that I WAS RIGHT. The bag was suppose to be only $20.00. The store manager that originally refused to honor the coupon, then contacted me, and the next week I went in to get the bag. But guess what? The coupon still didn't work right and this time it came up for only $12.66! LOL! The cashier said "I'm not going to fight with the computer, so you can have it for that price." I replied "That's sounds fine to me. I'll take it considering how much I was inconvenienced." So long story short, if you have an unresolved issue with a store, contact their corporate offices! 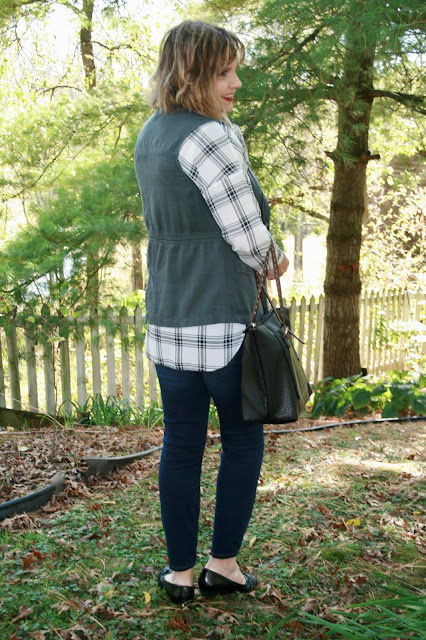 I have been on the look out for a basic black bag for a few seasons now. 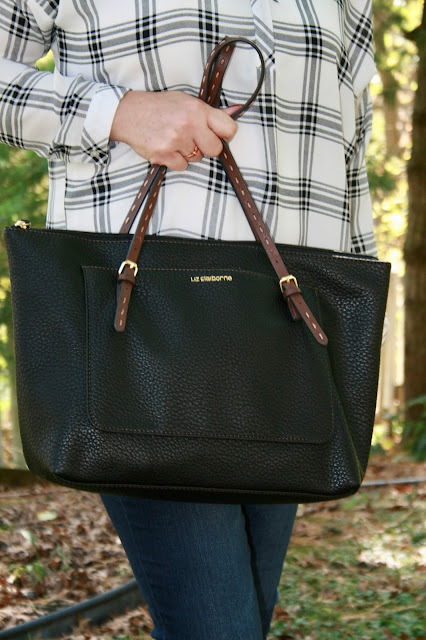 I have other types of black bags, but not a simple, basic tote like this one. I also love the brown straps! Here is my top without the vest. I didn't wear any jewelry because I was just running errands. I've shown you this top twice before HERE and HERE. Everything I'm wearing is old except for the Liz Claiborne Elizabeth Tote and the Liz Claiborne City Fit Skinny Jeans. So which way do you like this top better? With or without the vest? I can never decide. What do you wear running errands? I'd love to hear from you! Well, Amy, we're not big gilets wearers over here so I'd automatically go "without", though I can appreciate the warming layer and all those pockets. I can see it looks cute on you too. It's a matter of what you're used to, I expect. I took my cat in for his annuals earlier this month. He is unfortunately a frequent visitor to the vets, so once I finally catch him to cage him he's fine. Our other cat who died 3 years ago used to do EVERYTHING in his cage! 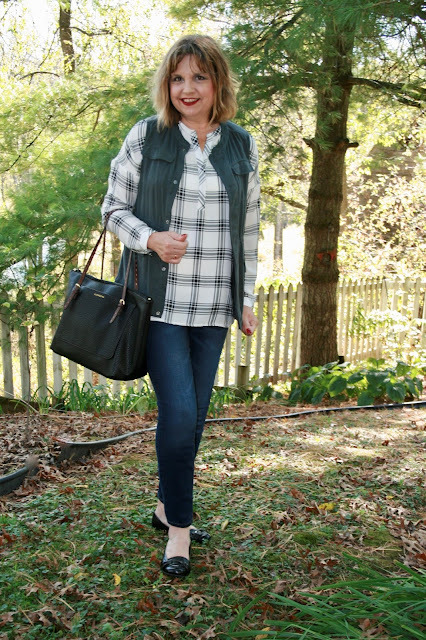 I love vests; would you believe I just purchased my 4th puffer vest? I appreciate the extra warmth without the bulk on my arms. I even wear them around the house! Oh, and I can't believe your cat did "EVERYTHING" in his cage. What a mess that must have been! So cute! I think I like it a little better with the vest, but it's so cute without it too! Thanks Lauren! I think I do too. It provides more structure and interest. Glad you ended up getting the bag for that great price, after all you had to waste gas and your time going into the store twice! The store should have called corporate right there the first time to verify the coupon! I think I like the look more without the vest, but it looks good both ways and I am sure the extra layer is helpful when it's a little chilly outside. My cats hate going to the vet too (or any car ride! ), luckily our vet is only about 10 minutes away. I know right? I'm not one to get all upset over stuff like that, but it was a one-day deal and I made the extra stop and then they didn't honor the coupon. Oh well, I got it for a better price anyway. You are lucky your vet is only 10 minutes away. If my vet were closer, we might make it home before he threw up! LOL! Glad your cat is doing well, love the way you styled the vest. Thanks Shauna! The vest is actually grey, but it might look green on your computer. Well I think it was karma the bag rang up for less the second time! Glad you were able to get it for a steal because it's a gorgeous piece! Poor kitty!! It's always so traumatic to get one of mine in the carrier too!! But you totally deserved to get that bag for even less than the $20! Good for you for persevering!! Thanks Jodie! I'm glad I did too! Love that top with the vest. What a cute outfit! I like it both ways! Thank you for linking up on Fancy Friday! 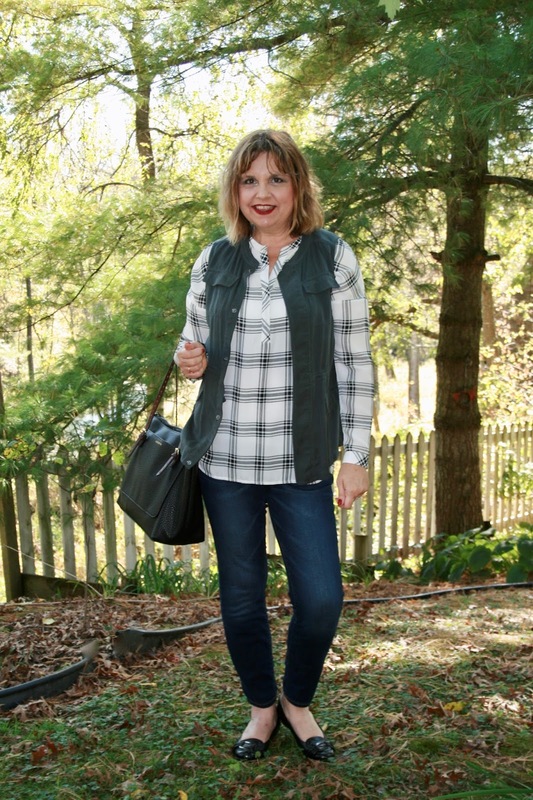 Love the top with and without the vest, but with the vest it's a super cute casual outfit. Love the tote too. I recently had to make two trips to my JCPenney because they never called me to pick up my jcp.com order. When I went to the store (a month later) it was there, but I told them to return it. The sales associate didn't do the refund on site and said I'd get a receipt via email. I never did and when I checked my card statement, they had not fully refunded me. I went back for my additional $5.62! Ha-ha! You sound like a girl after my own heart! A bargain shopper! My husband laughed at me once because I was over-charged 20 cents once at a grocery store and I went back to that same grocery store the next week with my receipt in hand and got my refund. I know, THATS BAD! I'm not cheap, I just get aggravated when things don't ring up right. It's a pet peeve of mine.